At Ohio Garage Interiors, the team knows that garage organization can be a daunting task. With heavy footpath flow and extreme temperatures, the garage seems like it will never be a place to get de-cluttered or enjoy. Now, getting organized never looked so good! 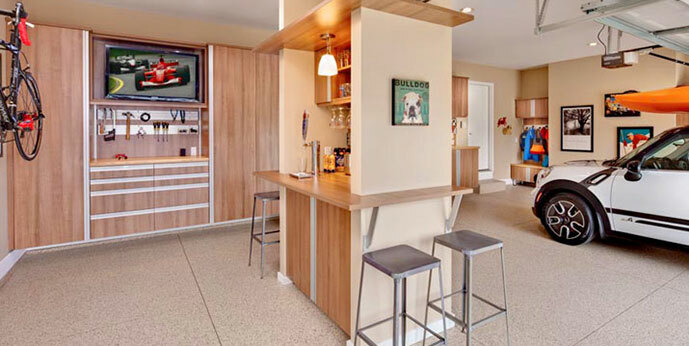 Ohio Garage Interiors wants you to see the potential it has and to re-invent your garage. They are the leading Northeast Ohio suppliers and designers of flooring, cabinets and storage products that will help you get the garage you deserve. Enhance your sturdy garage cabinets with wall hangers that organize your belongings to meet the full spectrum of your garage storage needs. Ohio Garage Interiors’ products will maximize your storage space and help you easily find your tools, sporting equipment, bikes and gardening supplies when you need them. Their garage organization accessories include an all-steel Silver Track Wall System, Storewall Wall System, bike options and safe overhead racks. Versatile and expandable, these systems let you easily determine the whereabouts of your belongings and offers easy access. All the systems come with a variety of hooks, bins and shelf brackets to help you store your items in the stylish and safest way possible. Contact Ohio Garage Interiors today and get a free design consult or look at their e-brochure. Let them help you imagine your garage in a new way and see what it can offer you.